The tradition of presenting a prospective bride with an engagement ring has been in existence for centuries. The Romans used rings made of iron to symbolize permanence and strength. The Greeks initiated the tradition of placing the ring on the fourth finger of the left hand where the vena amoris or “vein of love” was thought to have resided. The art of engraving rings first gained popularity during the 15th century. 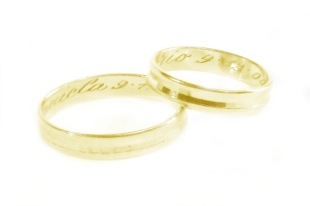 Posie rings are simple gold or silver bands engraved with a poem or sentiment on their outer or inner surfaces. Many of these classic rings are on display in museums in London and England. Shakespeare often made mention of posie rings in his works, a testament to their popularity during this era. Engraving enhances the meaning and beauty of any piece of jewelry. It’s an element that adds true personalization to a once-in-a-lifetime jewelry purchase. There are numerous jewelers that will design a custom ring for an engagement occasion. The pricing may be a bit more for this option but any woman would appreciate a one-of-a-kind creation for this momentous occasion. Ask friends and family for referrals of top notch jewelry designers in your area. Many couples opt to shop together for an engagement ring to ensure that the ring reflects the tastes of the soon-to-be-bride. This can really cut down on the anxiety level for a guy who is unsure of how to select the perfect ring. The use of engraving can add a bit of romanticism and surprise even when the girlfriend has been involved in the selection process of the engagement ring. The engagement ring will likely need to be sized to fit the prospective bride. Prior to picking up the ring, consider contacting the jeweler to request that a personalized inscription be added to the inside of the ring. There are several online vendors that specialize in engraved rings. It’s always important to read online reviews and feedback when considering using an online vendor. Online businesses who are members of the American organization of the Better Business Bureau offer an added sense of security to consumers. The costs associated with engraving are fairly affordable. The technology used for modern day engraving have reduced costs significantly. Check with the jeweler from whom the engagement ring is purchased but don’t be afraid to check with other jewelers for quotes on the engraving. Despite the many choices of engagement rings, engraving is an option that lends an unparalleled sense of intimacy and personalization to the selected ring. An engraved sentiment can add an element of surprise even if the prospective bride is involved in the selection process. Engraved engagement rings are timeless and elegant.